This essay is a response to Professor Edward Imwinkelried's article, "Should the Courts Incorporate a Best Evidence Rule into the Standard Determining the Admissibility of Scientific Testimony? : Enough is Enough When it is not the Best." The authors have two basic points. 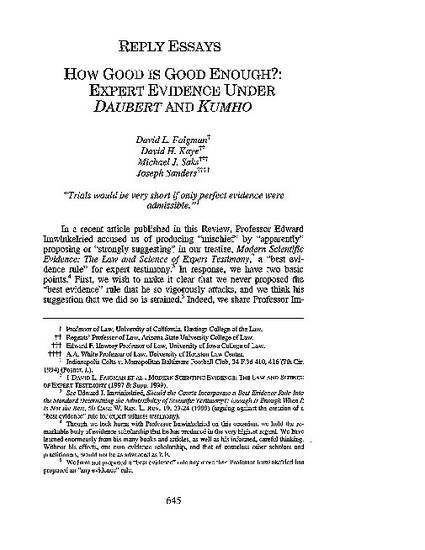 First, the authors wish to make it clear that they never proposed the "best evidence rule" that he so vigorously attacks, and they think his suggestion that they did so is strained. Second, they wish to reiterate that courts sometimes should do more than they have to ensure that expert testimony is reasonably sound. The important debate underway in the courts and the law reviews concerns the contours of the "better evidence" principle that the Supreme Court has placed between experts and the witness stand. The question that needs to be answered is this: How much better is goof enough?